I’ve been waiting for months for a book to grab hold of me and not let go—this one was it. It completely swept me up and into its world of politics, history, fantasy, assassination, treason, romance, and mystery. Ismae is handmaiden to Death. She is an assassin, sent to kill those with the marque of St. Mortain, the god of Death. 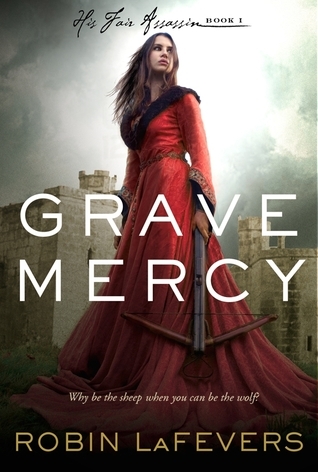 She is swept away from an arranged marriage at a young age and raised in the convent of St. Mortain, where she is trained in the arts of poison and weaponry. She is assigned to the High Court of Brittany where she is completely unprepared for the intrigue and treason of court. This book reminded me very much of Snyder’s Poison Study—but only for the assassin element and the way it gripped me and made me finish in it in a day. Ismae is a very real and likeable character. After escaping a brute of a father and a violent arranged marriage, she isn’t the biggest fan of men. Though the romantic element did not come as a surprise, it wasn’t as nauseating as I thought it would be. In fact, I loved it. Ismae is also a total badass lady. She doesn’t need to be rescued by anyone else, in fact, she ends up rescuing other people. I am so incredibly excited to get my paws on book two and three (and the fact that there are three books). I’m leaving for my honeymoon on Thursday, so I’m waiting until then to break into them—they’ll be fabulous for the plane ride! I rated this a 5/5 on Goodreads. I received a free copy of this ebook through Net Galley in exchange for an honest review.